1- Place 5 cups of homemade chicken stock in a large pot and heat over low flame . 2- Once the shock is warm, remove one cup and set aside. Drop the saffron in the cup of stock to dissolve. Set aside. 3- Heat olive oil in a large skillet over medium flame. 4- Add chopped shallots and stir until they are translucent. 5- Add rice and continue to stir until the mixture has absorbed the olive oil, the pan should start to appear dry, don’t brown the rice or shallots. 6- Pour in white wine, you should hear it sizzle when it hits the pan. Continue stirring until all the wine is absorbed. 7- Add the saffron infused cup of warm stock, and continue stirring until absorbed. 8- Repeat the process, by adding another cup of stock to rice and stir till absorbed. 10- Place the shrimp in the pan and add 2 tablespoons of stock to ensure the starch in pan doesn’t burn. Cook 2-3 minutes each side or until the shrimp turns pink. Don’t over cook them. 11- Return the rice and veggies to the pan and combine. 12- Add a cup of stock and continue stirring. Scraping the bottom of the pan to release the shrimp flavor until all stock is absorbed. 13- Taste the risotto at this point and see if you need the 5 cup of stock or if its ready. 14- Stir in the Parma and serve immediately. Note: This risotto also makes a great side dish for 4 people to accompany a meat or fish dish. 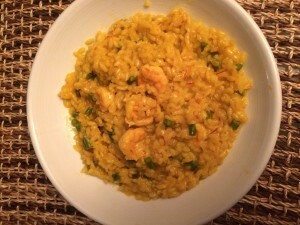 This entry was posted in Recipes, Uncategorized and tagged Frank Baldassare, Gluten free Risotto, Saffron Risotto, Saffron Risotto gluten free recipes, The Missing Ingredient gluten free living, The Missing Ingredient restaurant. Bookmark the permalink.